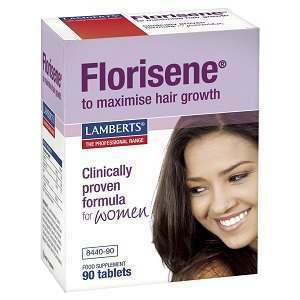 The following is a review of the product Florisene by Lamberts. The manufacturer of this product claims that it is a clinically supported product that has been designed to treat a condition known a Chronic Telogen Effluvium (CTE) that causes shedding of hair in women. Read on to learn more about its ingredients as well as our opinion of whether it is the right product to take for the growth of your hair. It is recommended that adults take three tablets of this product daily, preferably with water, half an hour before every meal. However, women who don’t have heavy periods or who eat red meat should take just two tablets of this product daily on an empty stomach. The amount of iron in this product can cause a mild stomach upset in sensitive individuals. It can also cause darkened and green stools. Pregnant and breast feeding women should only take Florisene after consulting with their doctor. You should also be careful to not take any other iron supplement if you are using Florisene. In case of an accidental overdose or an allergic reaction to any of the ingredient in the product, you should contact a doctor immediately. The price of this product is listed as $20 on the company’s website and includes 90 tablets which are enough to last a full month. The manufacturer of this product does not offer any kind of guarantee and this is an area of concern because you have no way of getting your money back if you are not satisfied with the product. The product also doesn’t have any reviews on the company website which makes it a questionable purchase. Florisene by Lamberts is a product that has been carefully formulated to address the major cause of CTE which is low serum ferritin. The amount of iron stored in the body of a woman can be a major cause of hair loss as well as thinning. Low serum ferritin can also be caused due to a less consumption of red meat or heavy periods in women. The manufacturer of the product claims that Florisene can raise the level of serum ferritin and can reestablish the normal growth of hair. However, the manufacturer doesn’t offer any kind of guarantee for the product and the fact that there are no reviews on the company website for this product makes it a questionable purchase. John Brownstone	reviewed Lamberts Florisene	on July 29th	 and gave it a rating of 2.5.